Metallurgy, science and technology of metals and their alloys. the term 'property' in a broader sense, may be defined as the quantity, which defines the specific characteristics of a metal. Materials are the driving force behind the technological revolutions and are the key ingredients for manufacturing. Materials are everywhere around us, and we use them in one way or the other. As a matter of fact, the following properties of metals are important for an engineer, to enable him in selecting suitable metals for his various jobs. Properties of materials include various types of properties like mechanical properties (such as strength, hardness, and toughness), thermal properties (conductivity), optical properties (refractive index), and electrical properties (resistance) etc. Here, however, we shall concentrate only on mechanical properties which are most important in manufacturing process and also in everyday life and we use these terms quite often. To understand the mechanical properties, it is useful to first understand the behavior of the material when subjected to a force which causes deformation. The strength of metal is its ability to withstand various forces to which it is subjected during a test or in service. It is usually defined as tensile strength, compressive strength, proof stress; shear strength etc. strength of material is a general expression for the measure of capacity of resistance processes by solid masses or pieces of various kinds to any cause tending to produce in them a permanent and disabling change of form or positive fracture. a) depending upon the value of stress, the strengths of a metal may be Elastic or Plastic. b) Depending upon the nature of stress, the strength of a metal may be tensile, compressive, shear, bending and torsional. Now, we study all these types of strengths. A material is said to be perfectly elastic if the whole of the stress produced by a load disappears completely on the removal of load. However, in nature no material is perfectly elastic, i.e., a certain limit exists for every material beyond which it will not be able to regain its original shape and size. This limit is termed as elastic limit. The modulus of elasticity or young's modulus (E) is the proportionality constant between stress and strain for elastic materials. Young's modulus is the property called stiffness; small values of E indicates flexible materials and large value of E reflect stiffness and rigidity. The property of spring back is a function of modulus of elasticity. Plasticity is the property that enables the formation of permanent deformation in a material. It is reverse of elasticity; a plastic material will retain exactly the shape it takes under load, even after the load is removed. It is of importance in deciding manufacturing process like forming, shaping, extruding operations etc. Metals possess more plasticity at high temperatures. Usually, plasticity of a material increases with increase in temperature and this is important in deciding the further operations. Gold and lead are the highly plastic materials. Plasticity is used in stamping images on coins and ornamental work. This property relate to the plasticity of materials. Ductility refers to plastic deformation under tensile load; it is the ability of a metal to withstand elongation or bending. due to this property, wires are made by drawing out through a hole. The material shows a considerable amount of plasticity during the ductility extension. This is a valuable property in chains, ropes etc. A measure of ductility is "percentage elongation". Before the tensile test begins two punch marks are made on the stem of the tensile test piece. Distance between these marks is noted and is known as gauge length (l0). After the tensile test piece fractures in two pieces, the two pieces are retrieved and placed together as close to each other as possible. Now the distance between the two punch marks is measured and noted again. Let this distance be l1. the % elongation is calculated as *100. High values of percentage elongation indicate that material is very ductile. Low values indicate that material is brittle and has low ductility. For mild steel, the percentage elongation usually is 20% or more. This Property relate to the plasticity of the material. Malleability refers to the ability of plastic deformation under compressive loads. This is the property by virtue of which a material may be hammered or rolled into thin sheets without rupture. This property generally increases with the increase of temperature. The metals in order of their ductility and malleability (at room temperature) are given below. Toughness ( or tenacity ) is the strength with which the materials opposes rupture. It is due to the attraction which the molecules have for each other; giving them power to resist tearing apart. Lack of ductility is called brittleness. When a body breaks easily when subjected to shocks it is said to be brittle. It is a property which is possessed in great measure by glass and other ceramics. A piece of glass if dropped on a hard surface shatters and is broken in many pieces. The real cause of brittleness is inability of the material to withstand shock loads. Of course, glass is an extreme case of brittle material. Hardness is generally defined as resistance of material to penetration. Hard materials resist scratches or bending worn out by friction with another body. Hardness is primarily a function of the elastic limit (i.e., yield strength) of the material and to a lesser extent a function also exerts a slight effect on hardness. Lack of hardness is called softness. When subjected to fluctuating or repeating loads (or stress), materials tend to develop a characteristic behavior which is different from that (or materials) under steady loads. Fatigue is the phenomenon that leads to fracture under such conditions. Fracture takes place under repeated or fluctuating stresses whose maximum value is less than tensile strength of the materials (under steady loads). Creep is the slow plastic deformation of metals under constant stress or under prolonged loading usually at high temperature. It can take place and lead to fracture at static stress much smaller than those which will break the specimen by loading it quickly. Creep is specially taken care of while designing I.C E ngines, boilers and turbines. A material with high value of modulus of elasticity is said to be stiff and a material with low value of modulus of elasticity is said to be resilient. 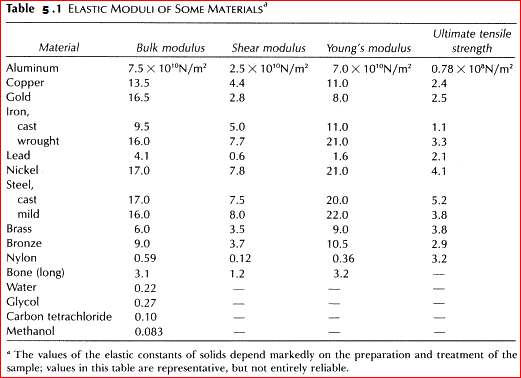 Consider a material undergoing tensile stress within the elastic range. If the material possesses a high value of Young's modulus (which is the modulus of elasticity corresponding to tensile stress), the material will not stretch much. It will behave as a "stiff" material. In this case, the slope of the line will be more. Resilience is a property which is totally opposite to stiffness. A beam made of stiff material will deflect to a lesser extent as compared to another made of resilient material under identical loading condition. This is defined as the property of a metal by virtue of which it can withstand varying stresses (same or opposite nature). The maximum value of stress, which can be applied for an indefinite times without causing its failure, is termed as its endurance limit. For ordinarily steel, the endurance limit is about half the tensile strength. This property of a metal is of great importance in the design and production of parts in a reciprocating machines and components subjected to vibrations. It is always desirable to keep the working stress of material well within the elastic limit. Ultimate strength: It is the load required to fracture a unit cross-section of material. Elastic Strength: It is the value of strength corresponding to transition from elastic to plastic range, i.e., when material changes its behavior from elastic range to plastic range. One cannot measure it accurately. This is known as ideal stress value and used to define elastic strength of a material. Plastic strength: It is the value of strength of the material which corresponds to plastic range and rupture. It is also termed as ultimate strength. In actual practice, a specimen is subjected to a stress which is always less than the working stress. The ratio of ultimate stress to the working stress of a metal is termed as factor of safety or factor of ignorance. This greatly depends upon the nature of loads or stresses. Usually, the following values of factor of safety are generally kept for various loads. One adopts the lower value of factor of safety by ensuring the metal to be without any defect, which is done through 'non-destructive' tests. In determining the reliability of the design, the factor of safety is of great importance. The tensile stress is expresses in N/mm2 or MN/m2 . In actual practice, a given specimen is always subjected to a tensile stress less than the working tensile stress. Tensile strength is obtained from the above relation. Tensile strength is the ultimate strength in tension and corresponds to the maximum load in a tension test. It is measured by the highest point on the conventional stress-strain curve. This strength provides the basic design information on the material's acceptance in engineering tests. In ductile materials the load drops after the ultimate load because of necking and this indicates the plastic instability. For working stresses, the ultimate tensile strength is a logical basis in brittle materials. We may note that like yield strength, tensile strength is used with a factor of safety. Compressive stress is also expressed in N/mm2 or MN/m2. In actual practice, a given specimen is also subjected to a compressive stress less than the working compressive stress. It is also expressed in N/mm2 or MN/m2. In actual practice, a given specimen is also subjected to a shear stress less than the working shear stress. This is also expressed in N/mm2 or MN/m2. In actual practice, a given specimen is also subjected to a shear stress less than the working shear stress. The change in dimensions or forms of matter under the action of applied forces is called deformation. It is caused either by the mechanical action of external forces or by various physical and physio-chemical processes. Normally all materials undergo some deformation in their daily use by the application of external load. We are mainly concerned with this type of deformation. A deformation can be classified as either : (i) recoverable or elastic after the removal of external force or applied load; such a deformation is termed as temporary elastic deformation, (ii) non-recoverable or plastic or visco-elastic deformation, this deformation remains even after the removal of the deforming force and applied load; this type of deformation is termed as permanent deformation. Both types of these deformations may be either independent or dependent on time. Metals exhibit less elastic but more plastic deformation even at room temperature while steady flow is predominant at higher temperature ranges. To form various metallic shapes the deformation of metals in necessary. Elastic deformation is the deformation which disappears when the load is removed. It precedes (takes place before) plastic deformation. This deformation occurs when a stress is applied on a metal piece. Such type of behavior is common to metals, ceramics, rubbers and polymers. Below Fig shows the form of the atoms before loading, after loading, in tension and compression respectively. When tensile load is applied, the piece before slightly longer and in compression it becomes slightly shorter. On removal of these loads it regain it's original dimensions. Such deformation in a solid materials obey Hooke's law. For elastic deformation, the strain is nearly proportional to stress. The ratio between stress and strain under deformation is called modulus of elasticity or young's modulus (E). Shear stress is also set up in crystal structure in engineering applications. These produce displacement of one plane of atoms relative to the adjacent plane of atoms. Obviously, shear stress tends to slide each layer of atoms past the next. The elastic strain is defined as the tangent of the tangent of the shear angle. Up to the limit of elastic displacement the shear strain is proportional to the shear stress. The ratio between shear stress and shear strain is known as shear modulus of rigidity (G). There are many materials, where Hooke's law doesn't hold good for engineering applications where deformation is large, i.e., for these materials, stress & strain, relationship is no longer applicable. Non-ferrous metals, mild steel, etc., are few examples which show deviation from perfect elastic behavior. It is the deformation which persists even after the load is removed. For most metallic materials, elastic deformation persists only to strains of about 0.005. As the materials is deformed beyond this point. Hooke's law ceases to be valid, i.e., stress is no longer proportional to strain and plastic deformation is observed. Plastic deformation is typically a function of stress, temperature, and the rate of straining. Plastic deformation associated with the displacement of the atoms within the grains and causes ultimately permanent changes in shape of the material. Tensile, compressive stresses can cause plastic deformation. In metals the plastic deformation generally takes place by the process of "slipping". The ability of metals to undergo plastic deformation is called ductility. stress has reached its maximum value. Slip is defined as a shear deformation that moves atoms by many inter atomic distances in one crystal plane over the atoms of another crystal plane. Because of plastic deformation, the crystals is divided into layers or slip blocks which are displaced in reference to each other and are separated by thin layers in which a considerable displacement of atoms has taken place. These intermediate layers with strongly distorted lattices are called "slip planes" slip occurs more readily along certain crystal directions and plane than along others. Where a single crystal HCP metal was deformed plastically. 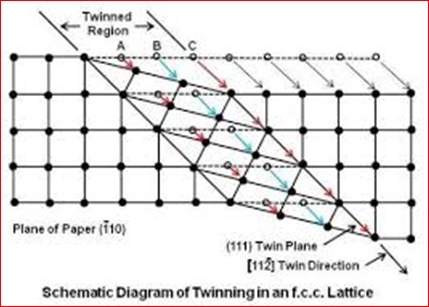 Twinning is the movement of atoms in the lattice, resulting in a division of lattice into two parts which are symmetrical but differently oriented. The amount of movement of each plane in the twinned region is proportional to its distance from the twinning plane and therefore a mirror image is formed across the twin plane. 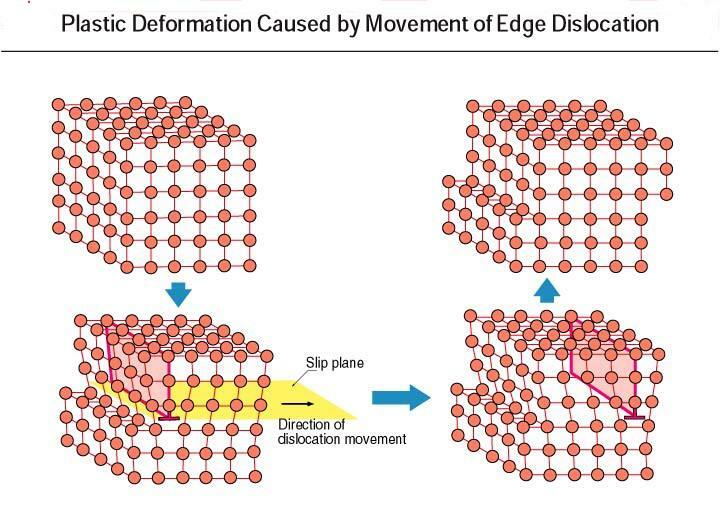 Deformation by twinning is most common in HCP metals and its effect on others is to move parts of the grains such that they acquire favorable orientation for the slip to occur. Twinning is produced suddenly and is accompanied with sound; the well known cry of Tin is the result of twinning. (1) Mechanical twins: These are produced by mechanical deformation. These are produced in BCC or HCP metals under conditions of rapid rate of loading (i.e., shock loading ) and decreased temperature. However, FCC metals are not ordinarily considered to deform by mechanical twinning although gold-silver alloys twin readily at low temperature. Mechanical twins have been produced at 4K. (2) Annealing twins: These are produced as a result of annealing following plastic deformation. twinned region of the crystal. forming of one slip band. Twins can form in a few micro-seconds only. twinning almost has no role. Twin lines always occur in pairs.